Getting a standing desk for my office was the single greatest purchase I have made in years. After all, sitting is the new smoking. I sat on a chair during patient encounters for years. Whether in the hospital or in the office, the priority was to seek out a chair. Between seeing patients, doctors lounge in the nurses station to write orders while sitting comfortably. I am proud to tell you that I am standing as I type this blog post. 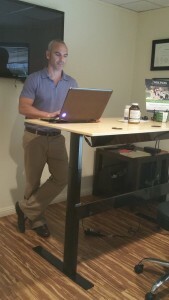 Patients like my new standing desk and some even stand with me. It leads to a very relaxed conversation between us. You do not have to stand all day long, but notice how much better you feel the more you are vertical. Breaking up long periods of sitting with activity is considered to be advantageous to the health of workers. Those with predominantly desk-based jobs should advance toward a total of 4 hours standing, advises a group of experts in a recent panel. This was published in the British Journal of Sports Medicine. Sitting even leads to musculoskeletal problems such a back pain, neck pain, etc. This a major problem for children as they sit in desks at school for most of the day. (2). I cringe to think of the damage occurring to our kids as they sit all day long in front of a computer. Sadly, schools are cutting back on physical education and recess as they strive for better test scores. 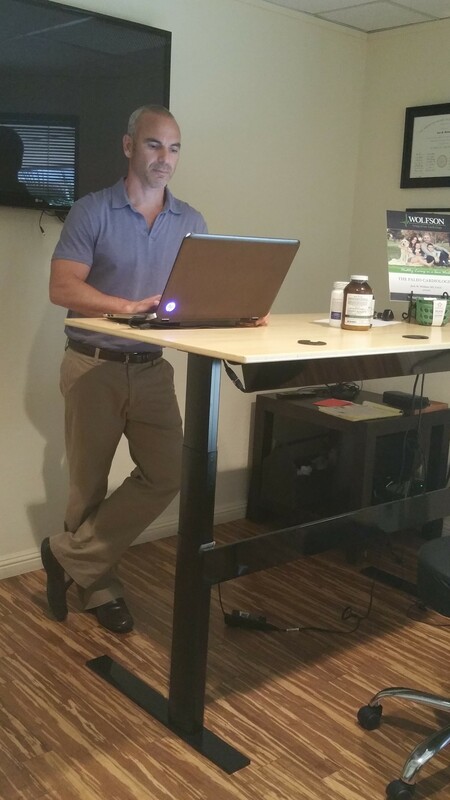 1) Buy a standing desk or ask your employer to do so. I recommend the NextDesk Terra model. Made in Austin, TX and no off-gassing. Didn’t smell at all right out of the box. It is a little pricey, but it is motorized so it can change from sitting to standing for most heights. They also have a cheaper fixed model and very helpful over the phone. 2) Start standing slowly. The first day try for 2 hours. Then work your way up to 6 or even 8 hours. 3) Make sure you move around. Don’t stand in the same position all day long. At least 5 minutes of every hour should be spent walking. Pump those calf muscles by doing calf raises. The popliteal vein runs in the calf muscle and blood is propelled back to the heart every time that muscle flexes. Don’t be afraid to ask your employer or boss. Many people are newly aware of the problems with prolonged sitting. Your boss likely wants to make the same change.